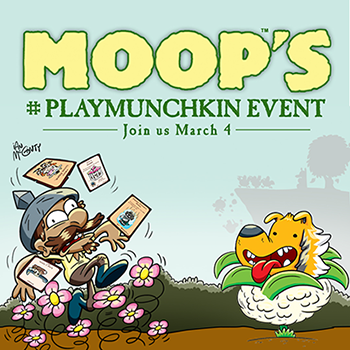 Daily Illuminator: Join Moop To #PlayMunchkin At Your Local Retailer On March 4! February 28, 2017: Join Moop To #PlayMunchkin At Your Local Retailer On March 4! Moop's Monster Mashup has received an upgrade worthy of the magician's infamy, so we wanted to celebrate with all of you! We have sent kits to 200 stores, and packed them with unique bookmarks, new promo cards, and a demo copy of the game for our #PlayMunchkin Event this weekend! With all of these fun giveaways to win and earn, you should come! Head to your friendly local game store on Saturday, March 4, play Moop's Monster Mashup, post pics of yourself playing to social media, and tag your store! You will take part in this wacky Munchkin game and be entered in our weekly contest at the same time. So, stop by your local shop, play some Munchkin, and get some awesome swag. Check this list of stores to see if your favorite location is participating, and join us March 4 for the game day!